DimeBrothers.com is Mark and Paul Nichols, identical twin brothers who seek to bring their ideas to the masses. Their hard-hitting and poignant invectives were honed on the harsh streets of the upper west side-er, um, that is, upstate western New York - where their only defenses against the bully were the confusion offered by looking alike and using big words to redirect attention. Begun in October 2006, DimeBrothers.com was the brainchild of Mark, but this does not prove that he is smarter than Paul. DimeBrothers.com touches on any issue plaguing their ever-wandering minds and is intended to be intelligent, funny, and witty. 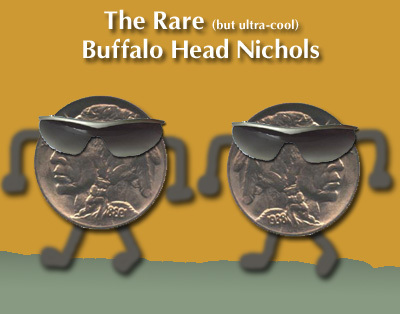 The site name comes from the fact that two nickels added together equal a dime. (Get it? Two "Nichols"...yeah, we know. Pure wit.) So read on, dear friend, and enjoy. Disclaimer: Wittiness not guaranteed. DimeBrothers.com makes no claim as to the veracity of the information on this site. Users should verify using Wikipedia.org or TheresJustNoWayThatsTrue.com. Mistakes may eventually be corrected... or not. All articles are solely the opinion of the writer and somehow not the opinion of the website, even though the website is publishing them. Readers are warned that reading articles on this site may lead to a waste of time and/or the diminution of brain cells. Funniness not guaranteed. Intelligence is also not guaranteed (the writers' or yours). Reading this disclaimer binds the reader to force others (family, friends, complete stangers...) to visit this site and thus feed the writers' egos about how popular DimeBrothers.com has become. Acceptable means of encouragement you must apply include word of mouth, spam, coersion, graft... Keep in mind you are legally bound to break the law now, so if you do not follow through, you are breaking the law. In another odd twist, Dime Brothers cannot be held responsible for your actions even though we are the binding force behind your future unlawful activities. Don't bother wasting your time trying to verify the legality of this - our in-house team of lawyers has guaranteed us that this is all 100% constitutional. Zigga created this Buffalo Head graphic using only a 9-volt battery, a tuning fork, and his "like-new" 1953 Electrolux vacuum cleaner. He then somehow got it into a digital format and uploaded to our website. Check out his personal site.